The Royal Shakespeare Company (RSC) is touring its acclaimed production of Hamlet, originally seen in Stratford-upon-Avon in 2016, to Salford, Plymouth, Hull, Newcastle upon Tyne and Northampton between January and March 2018, before transferring to London’s Hackney Empire between 6 and 31 March 2018. Directed by Simon Godwin, the production will see RSC Associate Artist Paapa Essiedu (read interview) reprise his award-winning performance in the title role as one of Shakespeare’s most famous tragic heroes. 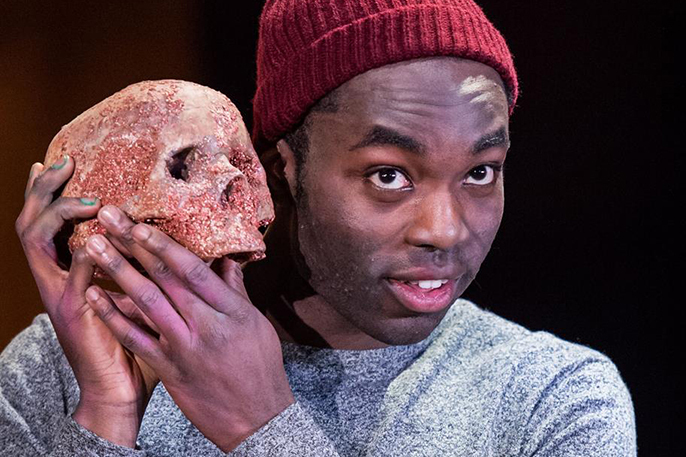 Paapa Essiedu won Best Performance in a Play at the UK Theatre Awards in 2016 for his role as Hamlet. Paapa’s other RSC credits include Edmund in King Lear, Fenton in The Merry Wives of Windsor and The Mouse and his Child. Additional theatre credits include King Lear (National Theatre) and Romeo and Juliet (Tobacco Factory). He played Demetrius in Russell T Davies’ adaptation of A Midsummer Night’s Dream for BBC1 (2016). Hamlet is directed by Simon Godwin and designed by Paul Wills with lighting by Paul Anderson. Music for the production is composed by Jamiroquai percussionist Sola Akingbola. Sound is by Christopher Shutt. Movement by Mbulelo Ndabeni. Fights by Kev McCurdy.